Two homestyle corn tortillas filled with a blend of Monterey Jack and Cheddar cheeses and the filling of your choice. Topped with one of our homemade sauces and served with your choice of two sides: black beans, pinto beans, Mexican rice, Mexicali corn, chipotle mashed potatoes, sauteed veggies or sweet corn cake. 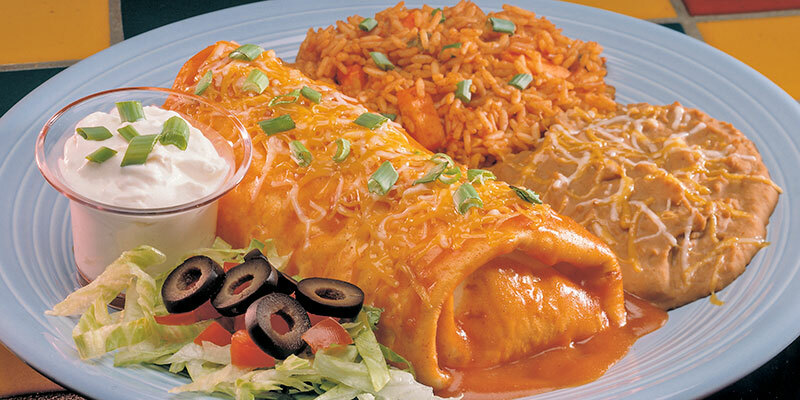 Add a third enchilada for only $1.99 more. Our fajitas are marinated strips of char-grilled chicken breast, Angus steak, pulled pork or seasoned shrimp on a sizzling skillet with sauteed onions and green and red bell peppers. Topped with a flame roasted jalapeno pepper. Served with our homemade flour tortillas and served with a garnish dish with lettuce, shredded cheddar jack cheese, real sour cream and spicy pico de gallo. Add guacamole on request. Add to or create your own plate from our selection of delicious tacos and side items. Available Monday-Friday 11AM - 3PM. When ordering off of the lunch menu, your complete party of 5 or less will be served in 12 minutes or less or your next lunch is on us!